How to throw a mystery party for kids, lazy Type B mom style. I didn’t think too much of it when Thalia told me she wanted to have a Mystery Party for her birthday. 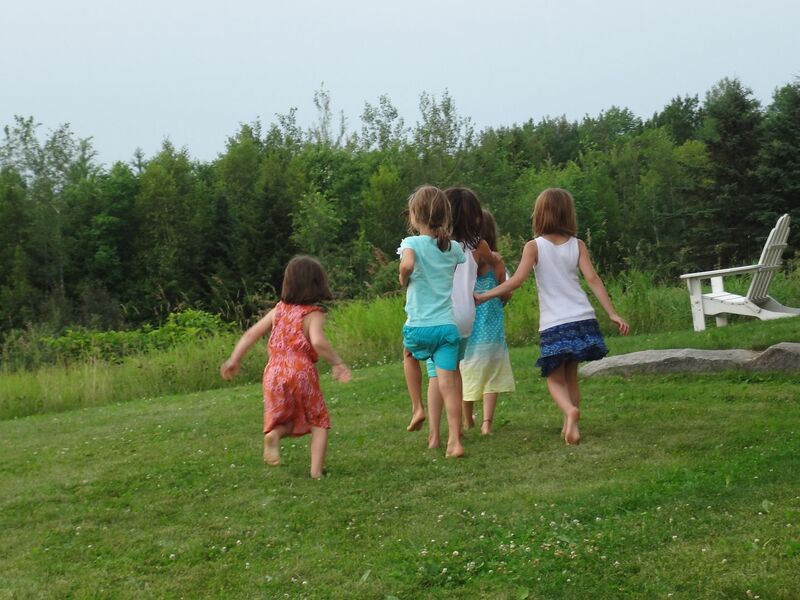 I wasn’t entirely sure how to pull it off, but I knew our guest list in Vermont last week was limited to four friends, two very younger little brothers, and two 10 year-old older brothers. Easy. I thought, I can do this! I’m creative! I have internet! I have recommendations from Twitter! I have Pinterest! Hoo boy. 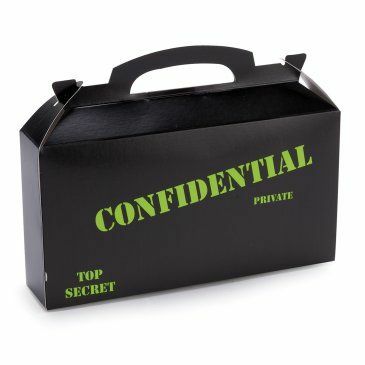 If you thought Pinterest makes you feel inadequate for not decoupaging your Scotch Tape dispensers or making cupcakes that take 7 weeks and a culinary school degree, try searching for spy party ideas. Some of the ideas I found were terrific. It really is fun to look for all the things you could do should you have the time, inclination, and supplies. Also, should you be Mormon. 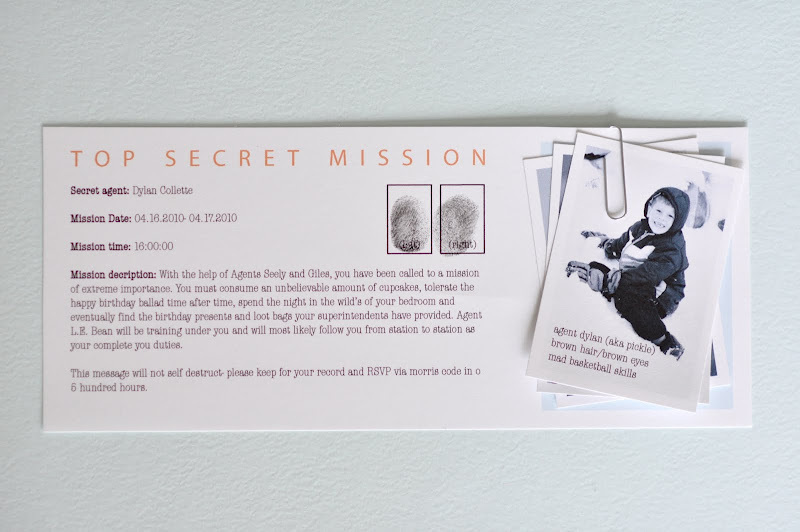 And so I present two different ways to throw a mystery party for kids. Neither, as it turns out, is wrong. 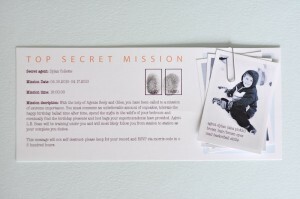 Greet your guests wearing a trenchcoat and detective hat and dark glasses, and hand them special mission cards. 18 different activities culminating in a costumed mystery scavenger hunt. The kids arrive in full costume and look amazing. 1. I Spy – 20 random objects on a tray, take one away, see who can figure out what’s left. 2. Musical chairs to the Pink Panther theme song. Worked great until Sage cried every time she was out, and the older kids had to take turns giving her their free chairs. 3. 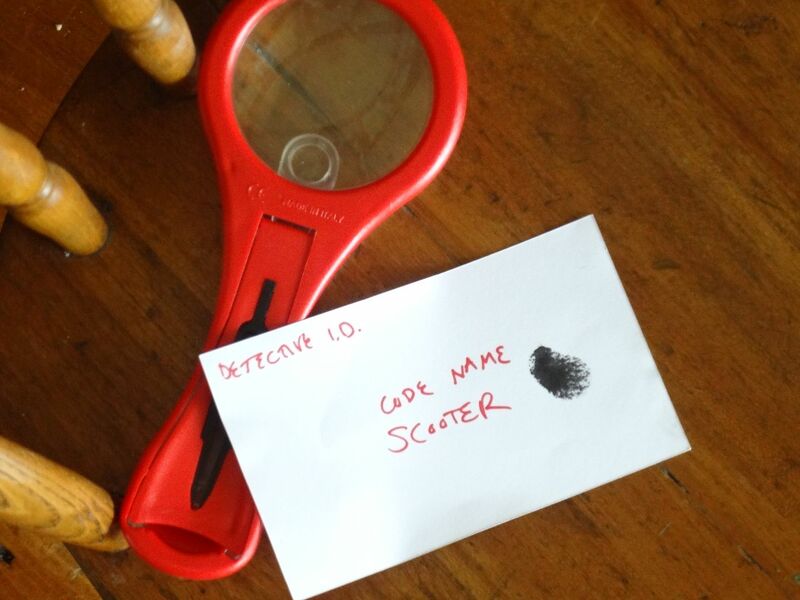 Run around the yard and solve a mystery in bare feet. Like uh, detectives must have done back before…shoes. Ready made and beautifully printed, thanks to companies that specialize in such things. Fortunately writing bad rhyming poems is squarely in my skill set. 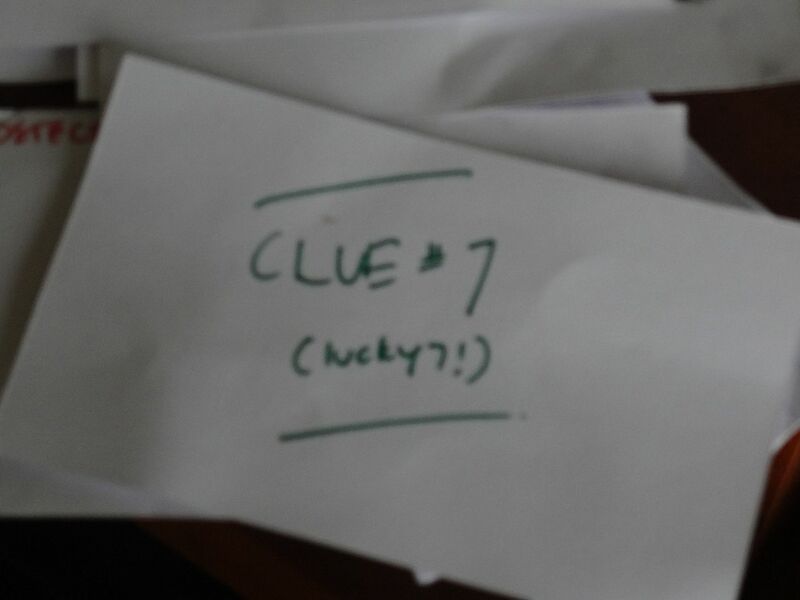 Unfortunately, good handwriting is not and I kept having to run to the next clue location to help them read the cards until they all found the big prize – their own goodie bags. Carvel ice cream cake with a big number 7 candle which thankfully, stayed lit unlike the others. The kids had the best time. As it turns out, the party guests did not notice my lack of detective wardrobe, sad design skills, or how well the cake matched the invitation. Mostly they were just happy to run around together, solve a mystery, play musical chairs, eat some cake, then jump around on the trampoline. The parents didn’t notice either; they were too busy finishing off the Sangria. 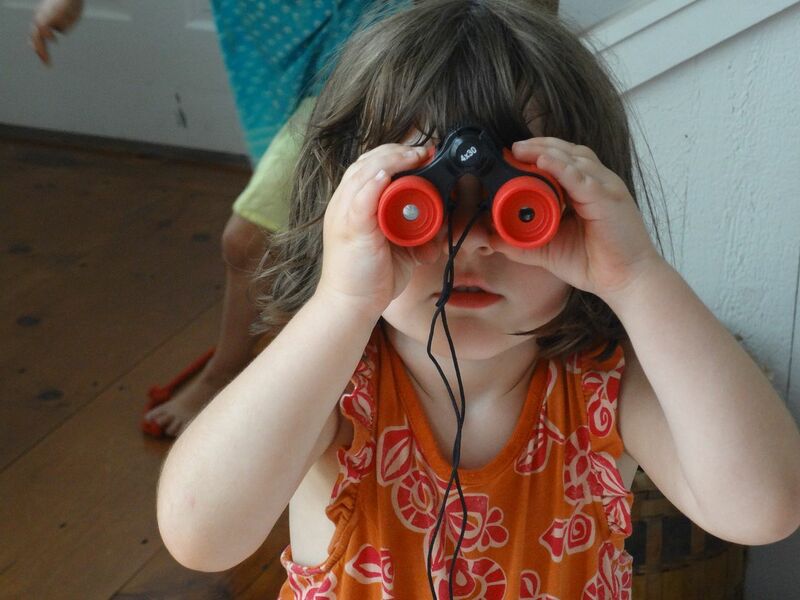 Thanks Huffington Post for including this in the Best of the Mom + Dad Blogosphere. I’m glad I’m not alone here! Newer: A few words on happiness. Actually, six. Sounds like an awesome party!! 🙂 I’d totally go if I were 7. 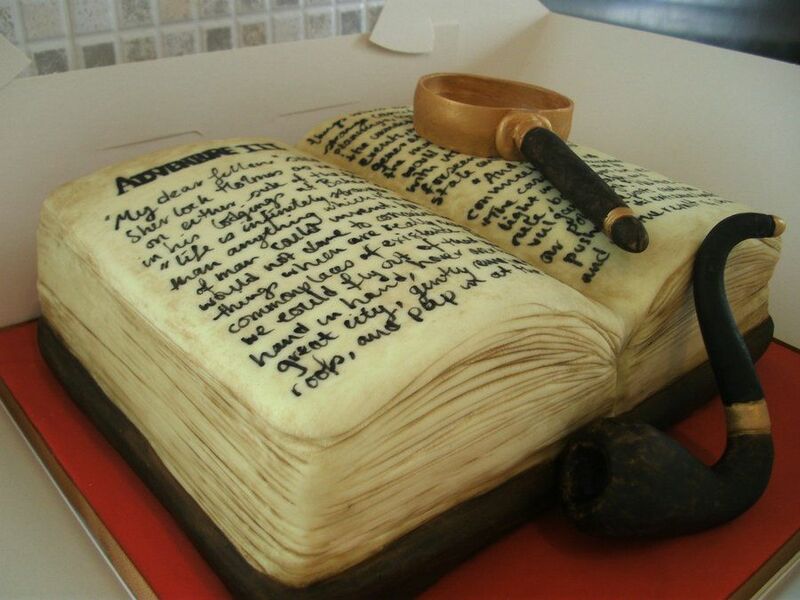 That Sherlock Holmes cake is NOT a cake. Awesome. I’m so completely a type 2 Mom. Our last birthday party featured play-doh. That was it. And everyone — including the adults — had a fantastic time. Type A stuff has great impact, aesthetically, but is it really worth the extra time/money? I don’t think so. I think it gives some people a lot of pleasure to put together parties, especially when they have great design sense and time. Bless them. I think their results are amazing. I will just never compete. Type B Moms don’t like slideshows. Type B moms love the lack of slideshows. I just want to scroll. No clicking. I don’t even think Type C moms like slide shows! Yay, other people who don’t like slideshows! I’m a scroller myself. 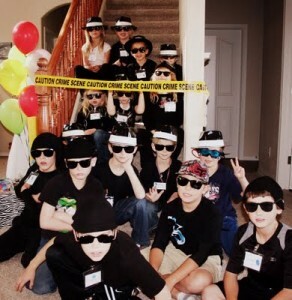 We had a Secret Agent party for my Jilly and I think was a Type AB mom in it. Yes, I had Etsy invites . And stick-on mustaches (which should be at EVERY party, they are just that fun). And name tags that I made with a Sharpie, an ink pad and a bunch of little fingerprints. But, we had it at a place that held the entire scavenger hunt/mystery on their grounds, the cake was from a bakery (and looked NOTHING like that book cake). Sometime I look at these WAY over the top parties and think, “WHO are they for? The parents or the kids?” Kids need nothing more than some time to play, some cake, and more time to play. Looks like Thalia had the best time! And woo for sangria for the adults! Fairly Odd Mother recently posted..Is there bullying in homeschooling? I wish we had had access to a printer in our rental house (I should have mentioned that) because the mustache ideas are adorable. I love this! Thanks for making those of us who can’t find their way around a 2-inch craft punch feel good. And nothing ever beats a Carvel ice cream cake. Nothing! Happy birthday Thalia! awesome. i’m still reveling in the years when my kid is young enough that birthdays don’t mean much yet (except to the parents, of course)–he’s 2. his 1st and 2nd parties consisted of a bunch of non-fancy food my husband made, a homemade cake (only homemade because i find it fun to bake), and a couple of guests to share it with. activities consisted of singing happy birthday and playing with wrapping paper. when i hear about kids getting super elaborate 1st and 2nd b-days, sure i understand that a lot of that is to help the parents celebrate the milestone, but i just get exhausted thinking about it. I loved our 1 and 2 year-old parties too. It’s all about one cupcake for the kids, and lots of booze for the grownups. Done! Looks like the birthday girl had a fabulous time! i feel so much better about my lame party planning. danke. Hilarious! I would have just not done a party and every time he/she asked I’d say something like, “If you knew when it was coming it wouldn’t be a surprise.” The real surprise would be the next birthday when he/she realized the entire year had gone by without a party! Lol. I’m evil like that. Type B mom–All The Way!!! Love this. I learned this lesson at my son’s last birthday–the kids were happy to run around–tye-dye their own t-shirts, jump on the trampoline and decorate cupcakes (I made from a box mix). I want my kids to have fun and the parties are for the kids, right? Excellent party–I may have to use your tutorial for my kids next party. Ooh, cupcake decorating! Maybe that’s next year’s “theme.” Love it. 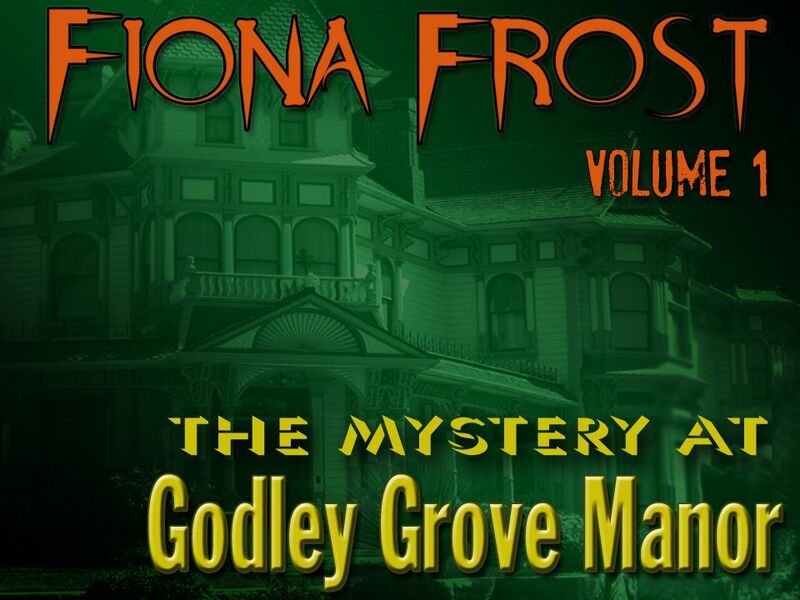 This post has completely inspired a Nancy Drew theme for Halloween. On other hand, my neighbour went to a party that was scheduled on local parking lot. Organiser brought two mini-goals, dozens of hockey sticks (plenty of those in these latitudes) and field hockey ball. Kids had a blast playing field hockey, ate hotdogs and some cake, drunk loads of fruit juice and were ready for a bath and a bed as soon as they got home. Cost: a gallon of juice, $1 hot dog per kid + cake. Fun factor: 11 (out of 10). I vote for type B (even when I’m type A). Enough with the decoupaging Scotch Tape dispensers! I’ve been a Type B mom ever since I threw a Type A mom party about 18 years ago, and at the end realized that my daughter (then 5 or 6) would have been just as happy with a Type B mom party and I would have been a lot saner. Now that my daughter is in her mid-20’s, I am hoping that I can pass down that experience as possibly the best advice my mother never thought to give me. I have no freaking idea how to throw these “cool” type of parties. In my experience, all you need is a pinata, cupcakes, and water balloons to make a party a hit. Kids don’t care about the fancy spancy tye of crap, that is for the parents. Thanks for the post! This post is just the best. All kids really want to do is run around outside and for we parents to just let them be. That Sherlock Holmes cake?? Oh my goodness, what gives??? That’s a crazy cake! Looks like the kids had an amazing time. Kristi @ PeetSwea recently posted..Shipping Out – One of my favorites! Love this. When I try to be Type A mom I inevitably screw up whatever I’m working on and start crying about how awful it looks. But then I remember that my kid’s favorite baby toy was an aspirin bottle filled with Cheerios she could shake and I feel better. I have been known to throw Type A parties. Other years I’ve thrown Type B parties. But my favorite type of party is Type C, where you go someplace that does parties and they do it all and then you leave and they clean up. Also, I’m totally missing something – I don’t get the Mormon reference. Selfish Mom recently posted..So what’s missing today? That’s totally my style…I like to pay Type As to do the work when I can. Unfortunately this year my oldest does not like any of the options I can find for what she wants…I’m gonna have to do it myself, darn it. I have done Type B (or C) versions of Type A parties, which means I look through the Oriental Trading catalog and come up with things KIDS think are cool rather ADULTS. 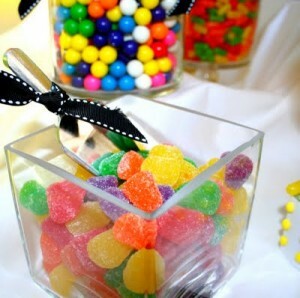 If there were a kid pinterest, your party would be on it! We did a “King and Queen” party one year. Crepe paper sashes, gold paper crowns (OTrading) with stick on jewels and markers, perhaps some swords? Maybe a deck of cards included in goody bag (king and queen cards, get it?) It was a while ago. They looked cute in a picture and they played regular old birthday games, ate cake and went home (winter birthdays don’t work so well for running around outside). Have to agree on the “go somewhere and have them do it” idea too. Costs more, but requires so very little brainpower. Or have older 2 children and pay them $20 each to “run the games” for a board/card games party for their little bro. That one worked well too! I was a Type A mom for my little guy’s first birthday. Then I became a Type B mom for his second. I usually try to aim high and this year is no different. I want a theme! I want color-coordinated balloons! 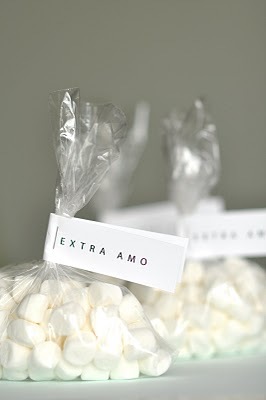 I scour the internet for cute theme goodie bags! But then I realize how much it costs, and how I hardly pay attention to decoration when I go to parties, and end up sticking to the basics. Last year the theme was colors, so I just made sure all the table cloths and balloons and plates matched. Yay! But like I said, I’m going to try and get more creative now. I’ll probably end up being an in between A-B mom this year. As an eleven year old boy was dropped off at my house, his mom remarked, “He loves coming to your parties.” I laughed. The events for the night, just like last year, were (1) run around the yard. 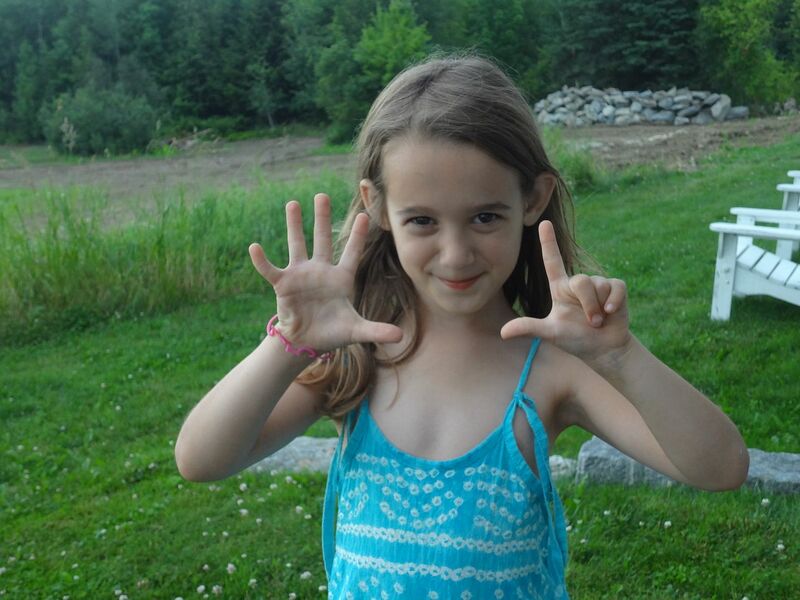 (2) eat dinner (3) run around the yard with flashlights – last year/glow sticks- this year (4) eat cake (5) run around the yard on a sugar high with what hasn’t broken or been lost of the glow/ light implements. (6) sleep or don’t sleep– I won’t care because you will be far away from me in a tent in the backyard. I was immensely flattered that he likes our parties. Maybe kids just need more time to run around the yard. We once had a parent say her daughter loved coming to our house to play dress up. I asked why and she said, “because you can be so creative…all that stuff you have.” I wracked my brain thinking of the mismatched assorted crap in bins we have and asked her to clarify. Who knew bandanas and scarves were more fun! Happy birthday to Finn! Also Frida Kahlo. It’s a great day. What a great mom you are to pull that off and while on vacation! 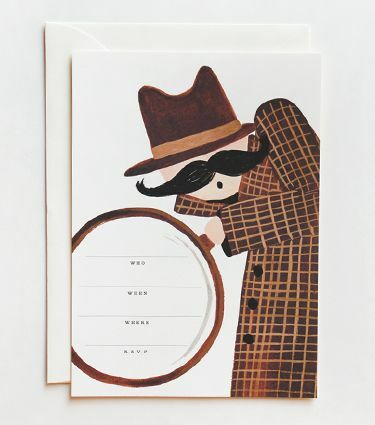 I have never heard of a mystery party….there’s so much to learn. Don’t even ask me where she got the idea! These are some of the best comments eva! Once, while making a fire truck cake for my then 2 year-old’s birthday, I got so frustrated that I chucked it across the kitchen. All of it. Nasty red icing, oreo wheels, makeshift pretzel ladder. My other son was 6 months, I was planning a 25th anniversary party out of town for my parents for the same evening as the birthday party, and my in-laws were coming in town, so there was obviously more weighing on my mind than whether or not gummy lifesavers were an appropriate choice for headlights. When the firetruck effectively became an airplane, I realized that, like so many of these awesome commenters, I am NOT a type A party planner, or a professional baker, or organized, or hell even good at making lists. Alas. We all had a good weekend just the same. And I likely had a hangover, but what can you do. Kelley recently posted..A Gathering of Spirits. 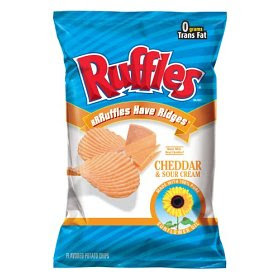 There is nothing “B” about Cheddar and Sour Cream Ruffles. They help me solve mysteries, too. Like how much Bravo! I can watch in one day. Great post! I have spent money on parties outside the house — you know the type with video games and movies and stuff…yet the best parties are the ones with pickup football, mud, and pizza. Period. I agree w comment above — the type a parties are for the blog. Type b parties are for the memories. Rachel recently posted..Everyone needs a wingman – even women. OMG. “Type B mom.” Can. Not. Stop. Laughing. I always try for Type A but have been known to default to Lazy Mode. LOVED this. Isn’t great that 7 year olds don’t have much access to pinterest to know what slackers the rest of us are. Therefore, they think we are great. A Carvel cake is awesome when you don’t know you COULD have had a super duper Sherlock Holmes cake. Ignorance is bliss! PS – I’m in the process of trying to talk my almost 8-year old OUT of a Magic Tree House party. I’m all for celebrating books, but this means I’M going to have to put on the party…instead of going to the skating rink or bowling alley or jumping place. I’d rather NOT be in charge of keeping everyone entertained. It’s just exhausting…not to mention just as expensive. It’s not working….so I’m currently researching how to make a make-shift treehouse (for indoors) out of wood pallets. Someone shoot me now…. And take them ice skating. I see this post as a reason for me to never try Pinterest. I still haven’t! Definitely loved the Type B style best. 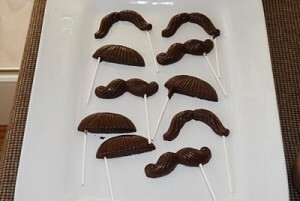 But those mustache lollipops were darn cute. Pinterest is awesome! I really adore it, and it’s a great resource for so many things. Just don’t uh..judge your design prowess against the pinners. You will lose heinously. So. Awesome. 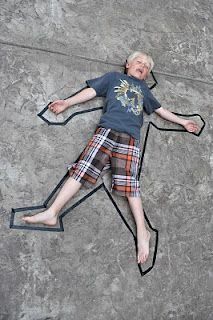 I actually live in Vermont, and you could have easily titled this “How to throw a mystery party for kids, Vermont-style”. 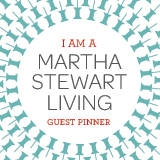 Most Vermonters don’t know what Pinterst is (not all, just most) and I am a conscientious objector, myself. Most of us here live the Type B Mom thing without a second thought. (Type A’s are good people, too.) Hope you enjoyed your stay! 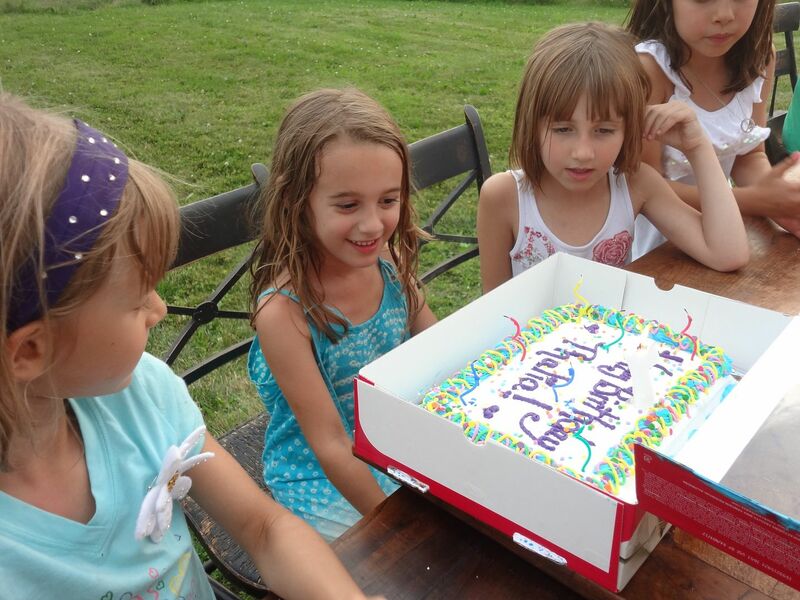 I’ve been on vacation and totally out of touch, but as soon as I reconnected with the online world, I came running to see how Thalia’s party went 🙂 It’s taken me six years to learn that as long as there is cake and friends, a birthday party will always be a hit. I LOVE what you did, type B or no. Exactly once, I’ve put my time and energy into a “fancy party” only to learn that no one had any more fun than the time we simply brought cupcakes to school and let everyone sing Happy Birthday. So cute.. It was sweet and simple yet creative! Loved this. I think that when we celebrate the Type B approach, we give each other permission to just breathe a little. Relax. Just finished a Type B party for my girls. It didn’t even have a theme or presents or goodie bags. It was basically, “Here’s some food, some sugar, now go play with each other.” They had a great time. Oh, and as I read part of this to my husband he says you forgot to add “Type ‘Husband'” to the list of offerings: put on a spy movie. And done. This is awesome! I have even told the boys one friend only. That makes it a birthday party in my book 🙂 I would rather do something with them then spend weeks planning a party! I am yet. Maybe a Bplus ( fingers crossed) I leave everything to the last min. My 7 year olds detective party is in 4 days and after reading this I’m worried ill be demoted to D type parent! Excellent ideas…the B ones that is. Best of luck…post pictures Tammy. I’m sure they’ll be better than mine! So glad to help! My kids actually look back on it fondly. For some insane reason. more knowledge about these issues than what most business owners and individuals do. information forthcoming from the Election Division other than referring to the web page. CPA exam courses may find they need formal exam prep so as to pass. Thank you! We’re planning my daughter’s 10th as a mystery party, and this added a nice dose of perspective. Okay, I’m the Type A mom, I admit it (I hang my head 🙂 Lucky for me my family doesn’t seem to mind my “over the topness” but as my husband says, “you’re still a kid, honey, but that’s why we love you.” I’ve created 30 foot long “waves of water” out of blue paper along the privacy fence and cardboard palm trees tall enough to strap to house pillars. One time my then 12 yr old daughters friends dressed like clowns, handed out popcorn and peanuts, we have a “fishing” pond – it was a circus/carnival theme for her younger sister. I do it because its fun for me to create. But the lady who wrote this article is correct: at the end of the day, when experiences are done out of love, it doesn’t matter how little or how much money is spent – it really is the thought that counts. I do ask that if it is even remotely possible, let your kids celebrate their birthday with their friends more than once, order a pizza. I’m always dismayed how many friends of my kids might have a total of one or two birthday parties by the time they are 14. We’ve had birthday parties at our house (for 3 kids) every year for 21 years now. And when my kids leave for college and don’t come back home, I will be done. That is all we get folks, just those precious few years. I love the type B pictures of the kids just being kids. They look so happy. 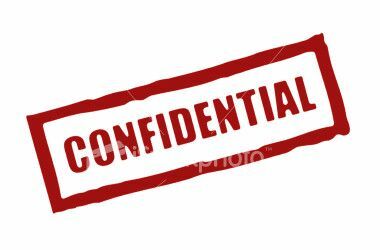 I agree that some people love to plan theme parties down to the last detail and thats great but sometimes I think it can go right over the kids head. I love you, fellow Type B Mom. Party is tomorrow and I just started planning…your post is the best thing I”ve found! Karen recently posted..What am I supposed to do with that? !